Our Bronze Collection Goose Down mattress toppers are the ideal indulgent treat for your bed. Use on top of old or new mattresses alike, to prolong their life and add an incredible level of comfort. The dual layer construction means you get the best of both: added support from the goose feather layer, and enhanced cushioning comfort from the goose down layer. FILLING: Lower layer comprises 100% Goose Feather for superior support. Top layer comprises 70% Goose Down, 30% Goose Feather for super soft cushioning. All our natural fillings in our Emporium ranges are Downpass-certified. FINISH: Dual layer, boxed construction for even filling distribution, and corner sash. CARE: Professional cleaning required. Do not dry clean. Tumble dry in a large capacity machine until filling is thoroughly dry. Shake and air regularly. Do not iron, bleach, vacuum or beat. 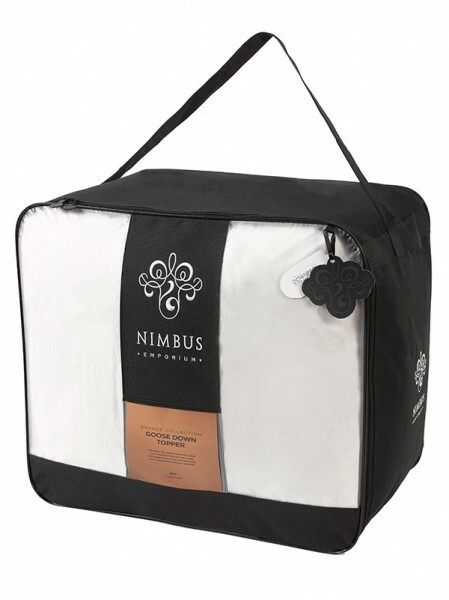 Click the button below to add the Goose Down Mattress Topper by Nimbus - Bronze Collection to your wish list.